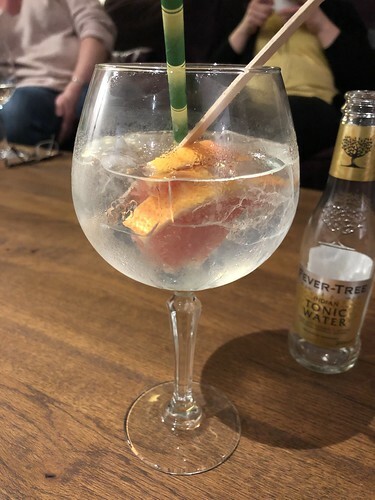 Had a fabulous night out with some ladies from church. I think the conversations were rather unexpected and we covered everything from death and burials to Airbnb and holidays. It was a fab evening and nice to meet some different people. Today was the scratch nativity at church. Always entertaining but seeing the vicar dressed as a donkey was a highlight for me. Not sure where the giraffe appeared in the biblical telling either. Today the church launched their Angel project. 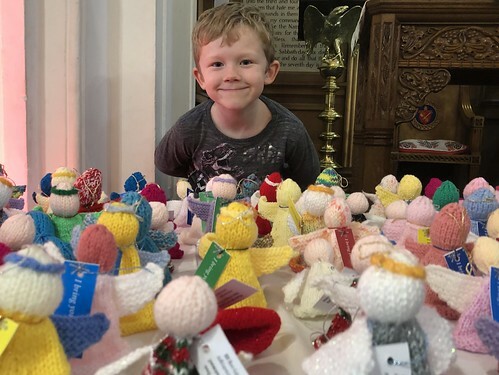 At some point this week about 600-700 knitted angels will be left around town for people to take home and hang up somewhere. I love the idea that lovely angels which had been handmade with love will be hanging as part of people’s decorations for many years to come. Throughout Advent Trinity church has something called The Posada. 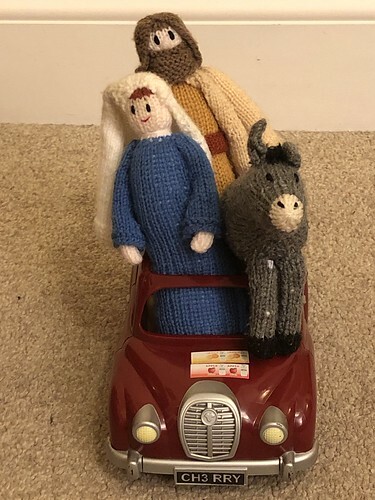 Mary, Joseph and the donkey travel from home to home, trying to find somewhere comfortable to stay for the night. This evening they stayed with us and they managed to find a car to help out with their transport situation. It has been a gorgeous day today. Unusual really as we had our yearly church on the beach event. Most years it is drizzly and a bit manky but today it was gorgeous and hot and sunny. Today we had a service on the beach with baptisms in the sea followed by a picnic. 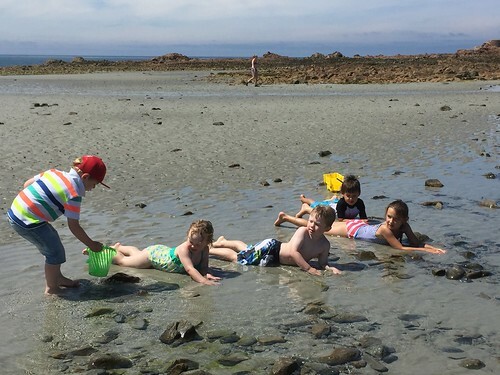 The children have made the most of being together and playing in the sea. Lovely. 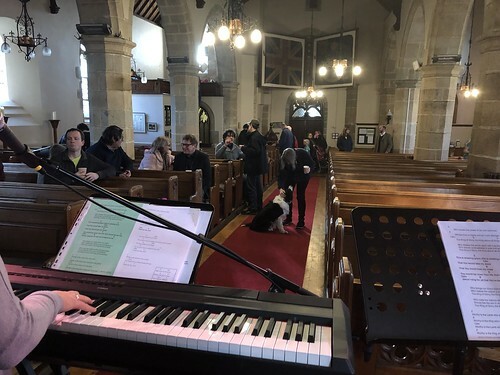 This evening I went to a friend’s induction service at a local parish church. It was brilliant to see him become a Rector, although the service was archaic, rather amusing in places and completely bizarre in others. I spent a good proportion of the evening wondering whether the Bishop of Dover’s staff came apart so he could pack it into a suitcase, and whether he carried his mitre in hand-luggage and if he got funny looks putting it through airport scanners. 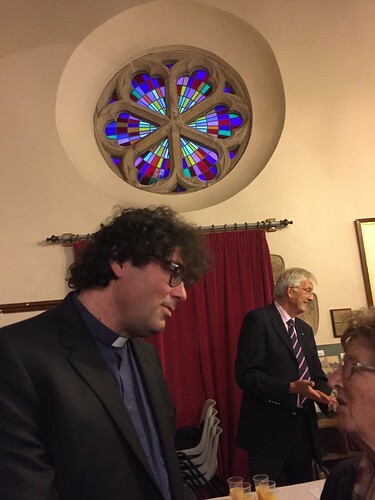 Here is a photo of Rev Adrian in front of my favourite stained glass window in the church! This morning I had to go back to the venue to help clear up some stuff. There was an amazing team and everyone did a brilliant job! This afternoon I took the kids to Messy Church for their Easter Service. It was lovely and we had a fab time. 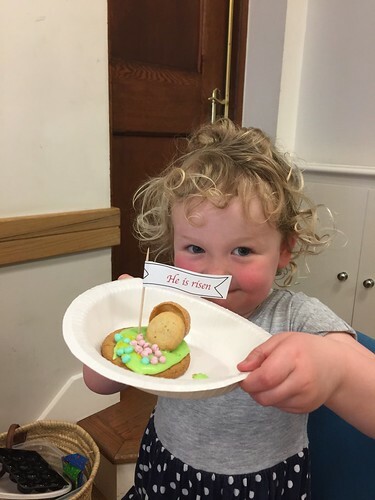 The Little Miss was particularly pleased with her decorated Easter biscuit though! 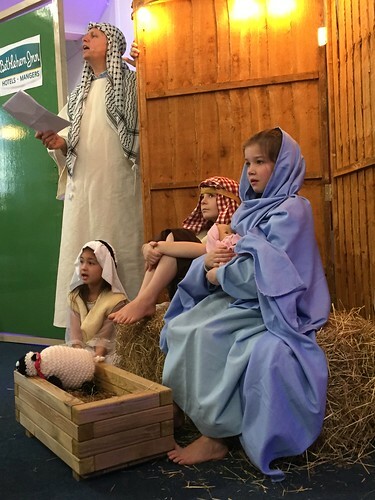 Today I took the kids to church and this morning it was the scratch Nativity. 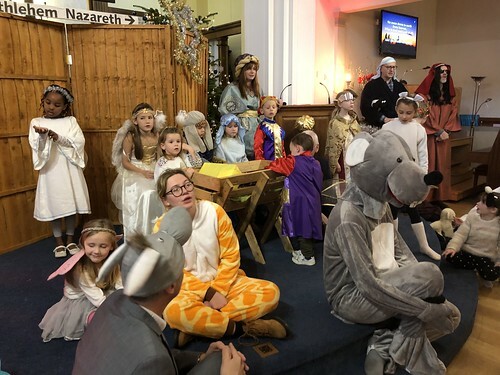 As you arrive at church there is a giant dressing up box available and you are given the option of being a king, a shepherd or an angel or anything else they have stashed in there! 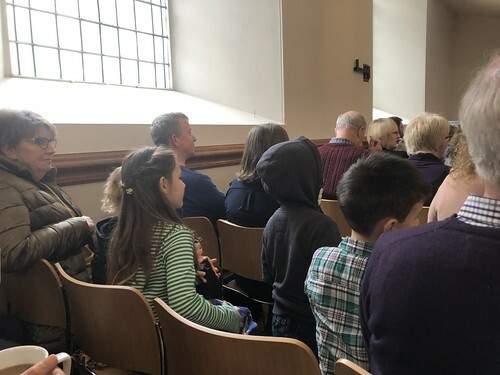 It always makes me laugh to see adults sitting in the congregation dressed like Wise Men (and women) and humble shepherds. I love this service. It makes me smile.